As you age, you know how important it is to stay active. I encourage everyone to exercise at a level that's appropriate for their abilities. But it's important to be aware of your limitations to avoid injury or making any existing conditions worse. That would certainly be counter-productive! One form of exercise that I often recommend is yoga. It's low-impact. And it helps reduce stress and improve flexibility, both of which are essential in helping us age well. It's often a great fit for people whose marathon-running days are behind them. However, as we age, we're also at an increasing risk of eye trouble. And if you have a particular one of these conditions, certain yoga positions may be dangerous. The condition is glaucoma, which can cause vision loss. It's the number-one cause of permanent blindness in the U.S. Glaucoma occurs when pressure in the eye, called intraocular pressure (IOP), builds up and causes damage to the ocular nerve. At this point, the only way doctors know to prevent or slow this disease is by keeping IOP at a healthy level. The problem with yoga is that certain positions can cause an increase in IOP. For most people, this increase quickly reverses when you come out of the position. But for people with glaucoma, the increase can push IOP levels into dangerous levels, potentially causing further damage. In fact, research has found that performing a headstand can cause IOP to double. A headstand isn't the only problematic position. In one study, researchers evaluated IOP in participants who performed four different poses (see pictures for position details): (1) downward facing dog, (2) standing forward bend, (3) plow, and (4) legs up the wall. Some of the participants had glaucoma while others had healthy eyes. Scheme Illustrating the Various Yoga Positions. The researchers evaluated the participants' IOP at baseline, immediately after they moved into the pose, after they spent two minutes in the pose, immediately after they came out of it, and after they spent 10 minutes resting. All of the participants had increased IOP in each position, with the biggest increase occurring in downward facing dog. Pressure also remained slightly elevated from the baseline after they rested. The researchers believe it will be important to repeat the study with more participants to more fully assess the differences between people with and without glaucoma. However, they do think it's wise for people with glaucoma to be aware of the risks these positions can cause and modify accordingly. 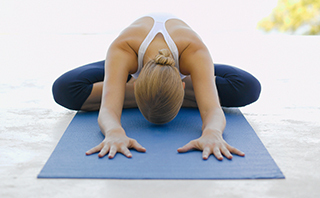 So if you have glaucoma or believe you're at risk of it and enjoy practicing yoga, be sure to talk to your instructor about modifying poses to avoid inverted positions.